NEW YORK STATE APOSTILLE ? Check out our low prices and service options. 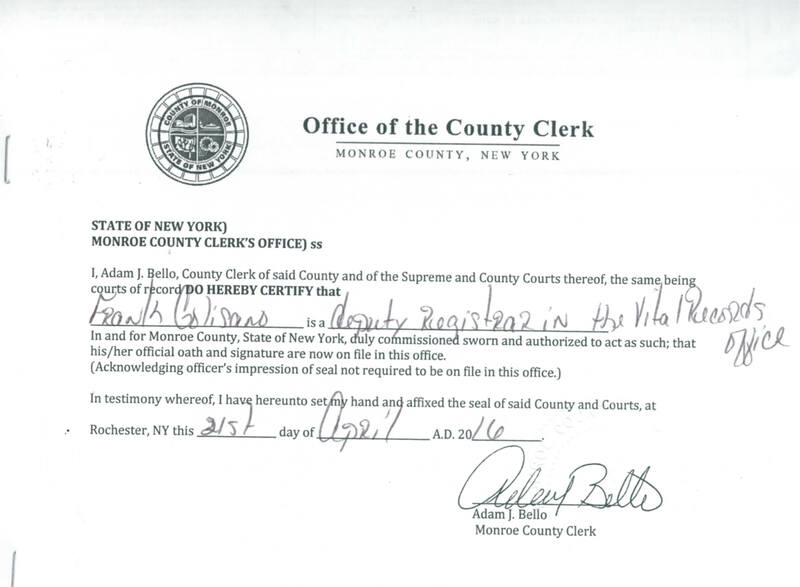 A client sent us a document that was notarized by a notary public who is qualified in Monroe County. We then had to send this document to Monroe County Clerk for a notary authentication so we could get an Apostille. A client sent us a vital record that was issued by the state of New Jersey. 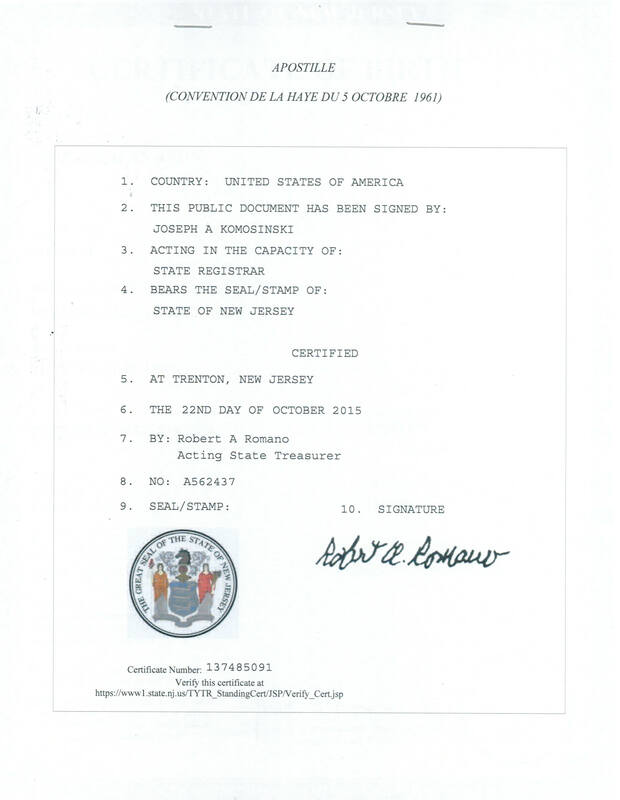 We then had to process this document by the New Jersey Treasurer so we could get an Apostille. The is an New York State Apostille for a document we got for a clients document. 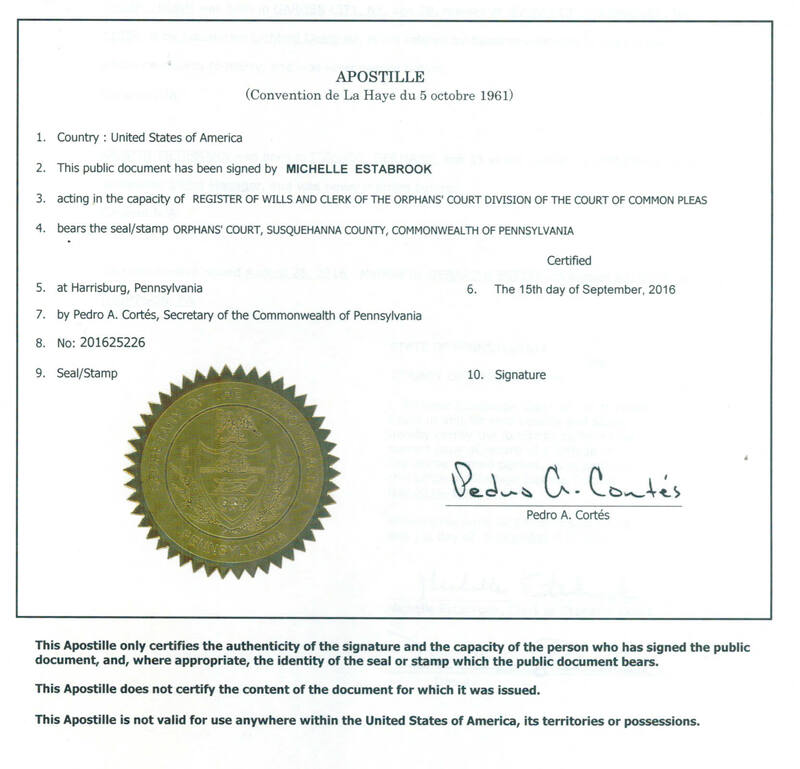 The is an Apostille from the state of Pennsylvania that we processed for a clients document. 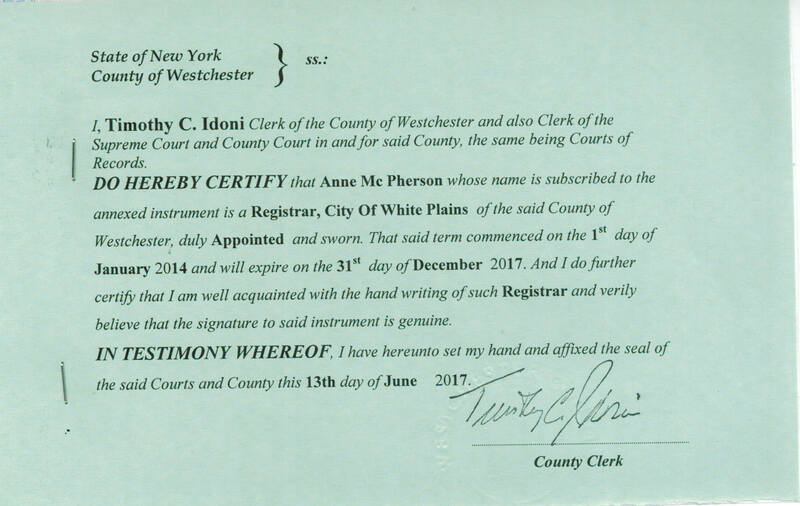 A client sent us a document that required the Authentication of the Westchester County Clerk. 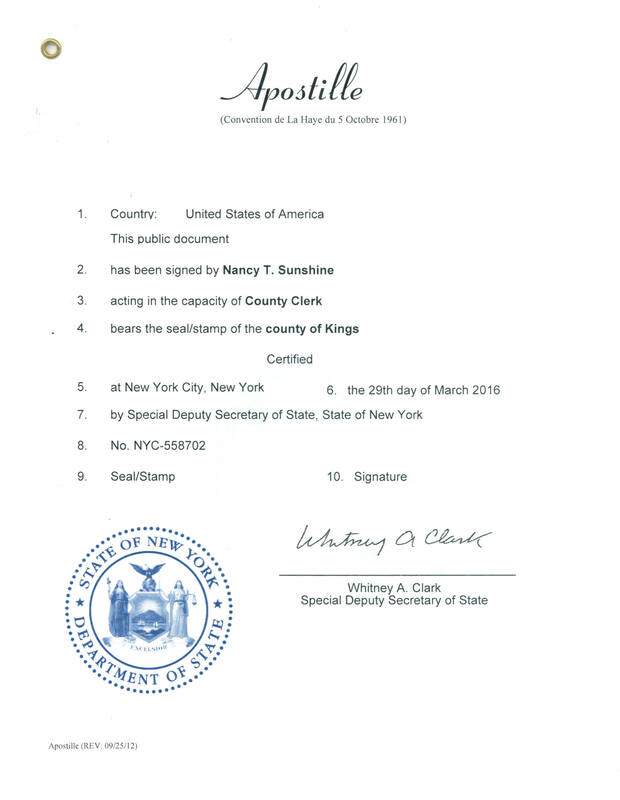 We were able to process this document to receive the Authentication so we could get an New York State Apostille. United States Department of State. Consulate General of the Arab Republic of EGYPT New York. Notary & Apostille Service provides Atestation Apostille/Certification Embassy Legalization Birth Record Retrieval Marriage Cert. Retrieval Divorce Retrieval Telephonic Deposition Document Translation Notary Authentication New York Consulate Document Attestation US Department of State Washington, DC Embassy Service. We'll provide a mobile notary public & the courier service to take your document to the various government agencies that are required to attest/certify or authenticate your document to get an Apostille or Certification of Authority for those countries that are not part of the Convention of 5 October 1961 Abolishing the Requirement of Legalization for Foreign Public Documents, (aka The Hague Convention). We can come to you to pick-up & Delivery your document to any location. We can also provide the USPS FedEx, DHL or UPS service to forward your document to another party. We have affiliate agents that can process document going to the US Department of State & any Embassy. Choice the service you need. Don't pay for services you don't require. From our À la carte menu choice the various service & options you need. Fast Next Day or Same Day RUSH Service. New York State Apostille Service. You can contact us by using our contact form. We provide Apostille Service for document coming from: Albany County, Allegany County, Bronx County, Broome County, Cattaraugus County, Cayuga County, Chautauqua County, Chemung County, Chenango County, Clinton County, Columbia County, Cortland County, Delaware County, Dutchess County, Erie County, Essex County, Franklin County, Fulton County, Genesee County, Greene County, Hamilton County, Herkimer County, Jefferson County, Kings County, Lewis County, Livingston County, Madison County, Monroe County, Montgomery County, Nassau County, New York County, Niagara County, Oneida County, Onondaga County, Ontario County, Orange County, Orleans County, Oswego County, Otsego County, Putnam County, Queens County, Rensselaer County, Richmond County, Rockland County, St. Lawrence County, Saratoga County, Schenectady County, Schoharie County, Schuyler County, Seneca County, Steuben County, Suffolk County, Sullivan County, Tioga County, Tompkins County, Ulster County, Warren County, Washington County, Wayne County, Westchester County, Wyoming County, Yates County. So we can show you how great our service is. We have assisted over 1,000 Apostille/Legalization & notary public customers in New York and in many USA states & countries around the world. 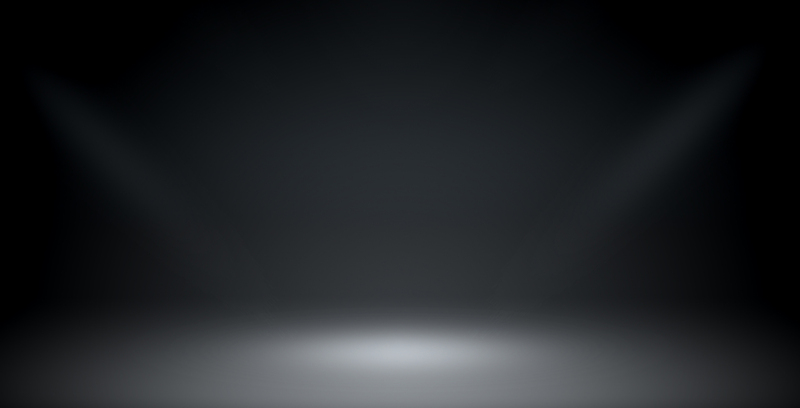 Here is a list of questions most frequently asked. Do I have to be present for you to process my NYC Apostille job so you can get an New York Apostille or Legalization? No, you DO NOT need to be present in order for us to receive an NY Apostille on your document. How do I get an Apostille for my school diploma & transcript? Educational documents must be signed by a school's administrative staff (e.g., President, Registrar, school liaison, & be notarize. There are other methods that we can use to bypass this requirement however, we must discuss this with you to see if this meets your requirements. You must send your original or email us a scanned copy of your educational document to be process. Can you notarize a power of attorney for 6 people in Suffolk County? All parties who are going to sign the power of attorney must be present. But, they don't have to be there at the same time. If you plan on signing the New York State "Gift Rider" on the official New York State Power of Attorney you will need to provide two witness just for that section of the Power of Attorney. Do I need to send you a copy of my ID or any other document? If you're just getting an Apostille, we don't require your ID, however, some Consulates & Embassies may require a photo copy of your ID, & or for you to sign a special form (e.g., China). Can you get a copy of my Birth Record, Marriage License, Divorce Record? Yes, we can help you get an original copy of your birth, death, marriage or divorce record, however, because records are personal you must first send us by mail an original notarized authorization letter that contains information to help us retrieve your document (e.g., the Index number, names of both parties to the marriage (including wife's maiden name) and the borough or town where the marriage took place. Can you notarize a document that is written in a foreign languages? How long will it take to have me document Legalizeds? Embassy Legalization is a very time consuming and the time it takes depends on the Consulate or Embassy it is going to. 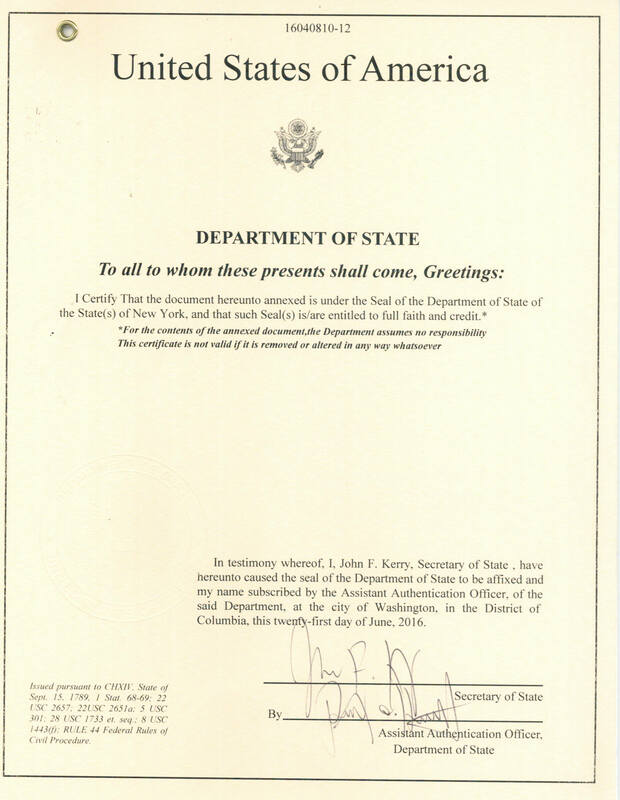 Once your document is authenticated by the local & state authority, it is either sent to the US Department of State in Washington DC. The US Department of State has a minimum of 4 days and it could be longer depending on their work load and the length of time at the Embassy. We accept all types of payment for services, Cash, Business or Personal Check, Money Order, Credit Cards, (which can be made directly on this website with a 2.5% surcharge, Checks, & credit cards and Money orders should be drawn from a bank located in the United States of America (USA). How much does it cost for the services you provide? The cost to do your job depends on how much work we have to do, each job is different, but if you send us your job information we can send you a estimated cost. Can I come to your office to have this work done? We prefer that you mail us your document, but if you must to come to our office, please call as many time we are out of the office doing mobile notary work or picking up document for client that require RUSH service. You can use the contact form or email us directly by Clicking here to Reveal our hidden email address. There is a small processing fee assessed per transaction for credit card transactions. * if you have a discount code then please enter it below and press the apply button. Subscribe to our newsletter for special discounts each quarter. There is a 2.75% Surcharge for Credit Card Processing.